Disneyland is full of wonderful frames and angles that lead the eye onto other sights, so today, I wanted to spotlight a literal frame in the form of the Disneyland castle leading straight into the heart of Fantasyland. 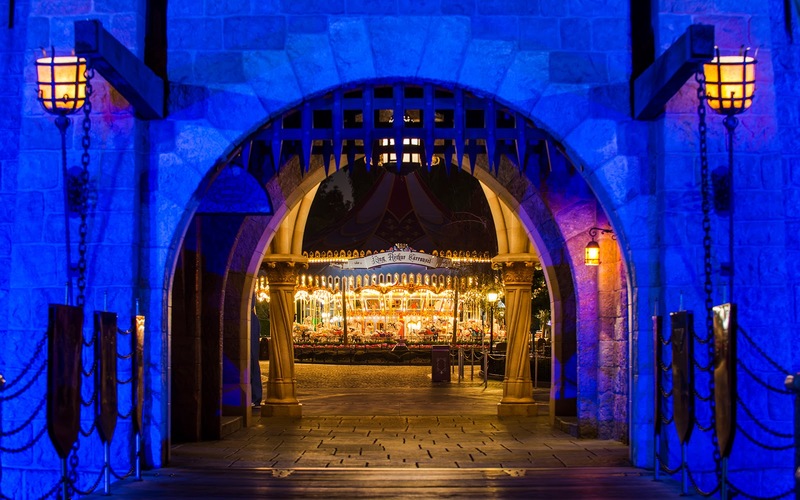 The King Arthur Carrousel provides a wonderful glowing object for the leading eye, and it beckons through the castle gateway, inviting guests to experience the timeless land of fantasy. At night, surrounded by the cool blue and purple hues of the castle, this golden lit attraction forms a regally colored composition! Looking through the portcullis of Sleeping Beauty Castle.